As a brand new, shiny parent, holding a newborn in arms, we set out with sparkling intentions. This baby is going to receive the best parenting possible – we vow not to repeat any unhelpful parenting that we have unwittingly been on the receiving end of. ‘I will do it differently’ we promise wholeheartedly. Like it or not, our childhood experiences will shape the parent we become, both positively and negatively. ONE: In psychobabble speak – we internalise the way we were parented. This means that we unconsciously learn from our parents, how to parent ourselves and others. 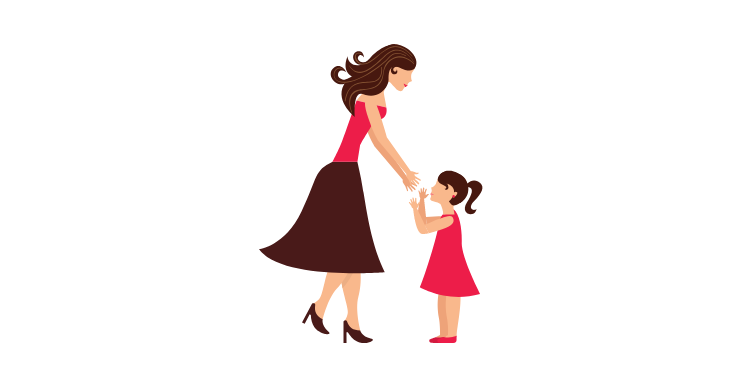 So, if you had a bossy and controlling mum, then you are at risk of being a super bossy mum yourself, or you might go the other way (in a desperate attempt to not repeat this bossiness), by becoming the most laissez-faire parent ever. These patterns are usually unconscious. We might rationally intend to parent differently, but then find ourselves back down an all-too-familiar path. TWO: When your kids hit particular milestones, your old memories will be unexpectedly revived. You might smell the stench of soggy cabbage from your school canteen, when hearing about the year 8 food fight at lunchtime. You will think about your own school uniform and how you were made to wear Clark’s shoes, whilst others pranced around in high-heeled sophistication. All these recollections that were buried deep in the closet will be awakened. THREE: You will pass on memories and traditions to your children. It might be the Christmas morning routine of stockings by the fireplace; the way you skilfully decorate a scrumptious, chocolate cake for a birthday or the family walks on a rainy Sunday afternoon, returning home for tea and buttered crumpets. FOUR: You may actually appreciate your own parents more. Who’d have thought? A tidal wave of compassion will emerge, as you lie awake in bed, waiting for your teenage daughter to return from the nightclub. You will think about your own teenage high jinks and how blissfully unaware you were of your parent’s perspective. FIVE: You will be oversensitive to potential threats that impacted you. If you were bullied, any sniff of a bully will leave you angry and defensive, wanting to ‘go up the school and sort it out’. You will cry silently on your child’s behalf when they are not invited to a party, taking you back to your own personal memories of rejection. SIX: You will inevitably clash with your partner over parenting. It’s going to happen! You are both bringing your often different values and traditions to the mix. However, you will learn from one another and there will be some compromise as you create your own family history. SEVEN: At times you will be emotionally overwhelmed with tears, anxiety or frustration, feeling baffled as to why. If the reaction seems disproportionate, look to your past for possible answers. Our own past will heighten emotion in the present. Your past brings a rich tapestry of memories and experiences. Hopefully, you have been fortunate to have a mainly happy childhood and this will impact your parenting positively as you pass on the baton to future generations. If your childhood was less rosy, you might have to work a bit harder at this. Though, with good awareness, you can consciously create a different experience for your own kids. If you feel that you’re struggling with this, it could be the time to reach out and have further support through counselling.